Formula Electric Belgium is proud to share the new design of its electrical vehicle. On Wednesday, February 21st 2019, we welcome you on our Digital Roll-Out event at the KU Leuven De Nayer campus in Sint-Katelijne-Waver. Be prepared for an inspiring evening! We will reveal the design of our future elecric vehicle together with its name and the innovative technologies we have implemented to reach a higher level of performance. After a short presentation you can enjoy a snack and a drink at our network evening. After a thrilling summer during the competitions, it is time for the new team to prove themselves. This new team will exist of 21 core teammembers who will be assisted by 9 thesis students. This year Willem T’Hooft will be in charge as new team captain. 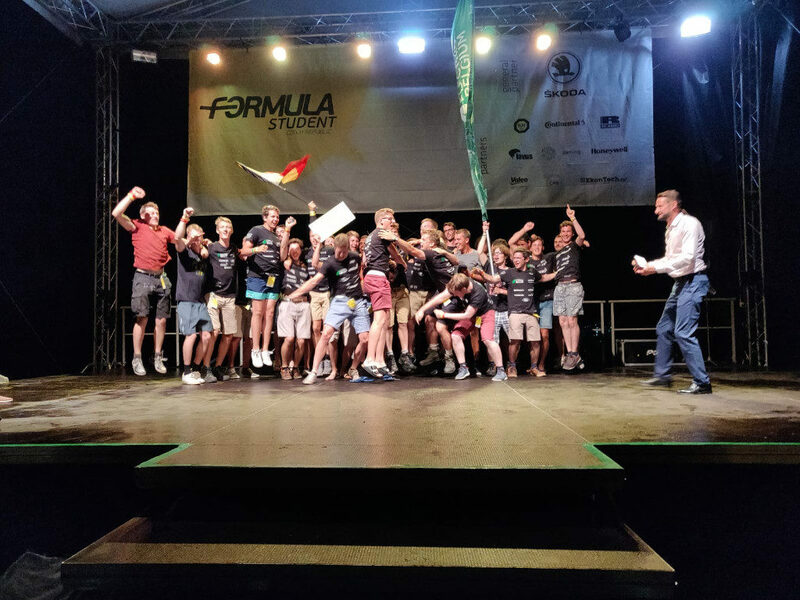 To ensure the smooth co-operation within the team he will be accompanied by Brent Ooms (Chief Engineer), William Wauters (Head of Chassis), Victor Nuttens (Head of Powertrain), Yentl Frickx (Head of Electronics), Jordi Van de Velde (Head of R&D), Joppe Weustenraad (Head of Marketing), Hendrik Vandeput (Head of Operations) and Michiel Van den Brandt (Head of Support). Before the Umicore Pulse was allowed to prove itself on the track, it had to withstand a comprehensive technical inspection, the scrutineering. The feedback we got in the Netherlands was processed very well, leading to the Umicore Pulse being the first electrical vehicle to pass this scrutineering. On the second day of the competition the static events took place. In these tests the team shows its engineering skills, professionalism and entrepreneurship. The highlight of these events was earning the first place in the engineering design event. Also in the dynamic events the Umicore Pulse showed its worth by setting the third best time in the acceleration event! We also barely missed the podium on the skid pad event on which we ended up in fourth place. This year our cooling was designed using AI, with this technology we can achieve superb performance while also pushing the boundaries of innovation.